What Metal Is Good for Baking Cheesecakes In? Can You Use a Glass Pan to Cook a Roast? Choosing the most appropriate cookware can enhance both your meal and the preparation process. 1 What Metal Is Good for Baking Cheesecakes In? 3 Are Nickel Lined Pans Safe? From glass to silicone, stainless steel to aluminum, a walk down the cookware aisle of any department or big-box store offers a range of choices. With all of the options available, it can seem difficult to choose the best cooking ware for your needs, but a few simple rules apply. Select cookware based on the dishes you want to prepare for your family and the kitchen equipment you use to cook with. Glass is used to make a range of cookware, from pots and pans for the stovetop to oven-safe dishes and baking trays. When compared to light-colored, shiny metal cookware, glass cookware absorbs more heat. This causes the food within to cook faster and brown more, making glass a good choice for breads or pies, but not as appropriate for cakes or cookies. When baking in glass in a recipe that specifically calls for shiny metal cookware, reduce the oven temperature by 25 degrees F to compensate for the shorter cooking time. Glass cookware is not recommended for use on halogen or induction cooktops, but can be used on conventional coil, solid-disk, ceramic and gas stovetops. Unlike aluminum and carbon steel, glass cookware does not react with acids and alkalines found in many foods, such as tomatoes and other fruits. Silicone cookware, a relatively new introduction to the market, consists of a synthetic rubber made from bonded silicone and oxygen. Silicone is used to make flexible bakeware. Silicone products’ main advantage, according to the University of Missouri Extension, is the ability to be transferred back and forth from the oven to the freezer. Cookware made from 100 percent silicone doesn’t release toxins when heated to high temperatures, but the integrity of pieces made with fillers -- which can be detected by twisting a pan and looking for white streaks – hasn’t been tested. Silicone can only be used in the oven and is not appropriate for stovetop cooking. Stainless steel ware can be used both on the stovetop and in the oven. This rust-proof material consists of a combination of nickel, chromium and steel. Stainless steel resists corrosion, cleans easily and is durable, but it can develop hot spots or warp, according to the Utah State University Cooperative Extension. Stainless steel does not conduct heat evenly, so many stainless steel pots have aluminum- or copper-clad bottoms to improve their conductivity. Stainless steel cookware can be used to cook most foods, but if you’re preparing a salty or acidic dish that requires a long cooking time in the pan, choose a different material. If left in a stainless steel cooking vessel for too long, acid and salt can create pits in the steel surface. Stainless steel pans can be used on halogen, induction, sold-disk, coil, ceramic and gas cooktops, as well as in the oven. 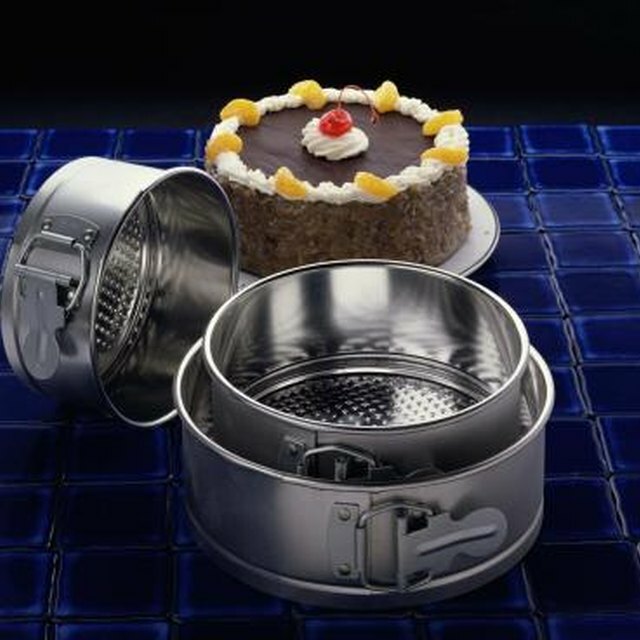 Other cookware materials include copper and aluminum, the first and second fastest heat-conducting cookware materials. Copper pans are a good choice for stovetop cooking, especially when making foods that require very precise temperatures. Aluminum is especially common in frying pans. Food sticks to untreated pans, so most are either anodized or covered with a nonstick coating, such as Teflon. Nonanodized aluminum cookware should not be used to prepare acid, alkaline or salty foods, as these may react with the metal. Cast iron provides another option. These heavy, durable pans conduct heat evenly and can be used both in the oven and on the stove. Unglazed pans add iron to foods cooked in them. Cast iron pans rust if not cleaned and treated after use. Does Heat Transfer Evenly Through Different Baking Sheets?